Recipe for success: take one jet airliner, crash on tropical beach. Imagine 48 modern, urban civilians cast suddenly upon the beach of a tropical island. But (rising spooky music), this is no normal island paradise... something strange is going on here; strange even for an exotic tropical island. The survivors find themselves neighbors with polar bears, a gigantic yet unseen and possibly mechanical monster, cryptic radio messages in French and the Mysterious Hatch. What’s there not to like? 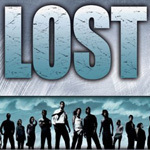 Not much, apparently, as Lost was one of the most successful (i.e., popular) TV shows of the 2004 season. There isn’t much of a plot to Lost because the whole show is primarily just a scenario. You could even make up a whole season of shows on the survivors’ back-stories alone, and this seems to be what the producers of the show had in mind. Of the 48 survivors, there are 14 regular characters and each has their story to tell. There is a young doctor who is the nominal leader of the survivors, his love interest (or is she really?) boarded the ill fated airliner in handcuffs escorted by a US Federal Marshal. There’s a has-been rocker struggling with a heroin addiction, and a big fat guy who says ‘dude’ a lot and is a multimillion-dollar lottery winner (and the number he won with appears again on the island!). And don’t forget the tough cowboy loner with a short fuse to a big temper, or the dad and his son separated by a divorce, united by a death. There are even a wheelchair bound survivalist who finds he can walk after the crash and an unwed expectant mom traveling to give up her unborn child. Any one of these folks would be interesting to be stranded with, let alone all of them. Fans of Lost (I am a one of them, hooked from the first show and loyal to the last week) will enjoy this DVD set. People new to the experience but who want to catch up with the rest of us should also be satisfied by this fine presentation. I do wonder, though, if some of the magic will be lost in being able to see the episodes one after another without having to wait a week in-between. My advice is to watch the episodes one at a time and wait a couple days before watching the next one. The production values in this project are first rate. In the two-hour pilot they are as good as any feature film. You can’t help but feel that this is ABC’s attempt to steal some of HBO’s glory from The Sopranos or Six Feet Under, but they do it by way of General Hospital, The XFiles and Gilligan’s Island. High in concept and production quality, the show nevertheless suffers from what it ultimately is, a TV show. Should we praise it for being a very good mediocrity or damn it for being a mediocrity with pretentious to something greater? If you are a fan of the show, the DVD extras are worth the price of this set. The entire 7th disk is given over to a variety of special features. Of interest to me were The Genesis of Lost, the back story to the series, and Designing the Disaster, how they got a crashed airliner to a beach in Hawaii. If you watch Genesis, you can see how a TV network can at the same time compromise and promote an idea. Conspicuous by his absence in any of the extras is Terry O’Quinn who plays the enigmatic Locke. One wonders what that might mean. A favorite extra feature was Departure/The Art of Matthew Fox, a portfolio of still shots done as mementos of the production of the series. Unlike the other feature shorts that are shot in an annoying moving-camera style, Fox’s artistic images are pleasantly presented as stills and pans. But the best special feature of the lot was Tales from the Island/On set with Jimmy Kimmel, a mocking visit to the set by the cable talk-show comedian. Here we learn who the Island Monster “really” is. On disks one and two are the usual commentary tracks, which are fun to listen to after you’ve seen the all the episodes and are hungry for more. There is also a Lost Scriptscanner that allows you to follow the script along with the pilot episode (but I was not able to evaluate that as it only runs on a PC; a Mac isn’t good enough). Supporting the show’s very good production quality, are very good picture and sound quality on the DVD. The show is presented in a widescreen theatrical format. It is a pleasure to watch the lush cinematography. The show’s score is moody and atmospheric and works very well with the imagery.